The Leinbachs were retiring and chose to build in Solterra, a passive solar cohousing community in Durham. A southern wall of windows allows winter sun to enter deeply into the home and warm the concrete floor and four foot gravel base beneath, a significant thermal mass. Overhangs protect the interior in summer, and a continuous trellis, supporting a white wisteria vine which dies back in winter, tempers summer heat on the south-facing terrace. Building within tight spatial and budgetary constraints, we developed a design that used every square inch of the lot, both inside and out. Using fencing, trees and shrubs, we enclosed a sequence of usable outdoor "rooms," onto which indoor ones opened. These outdoor “rooms,” and the paths that connect them, have varying degrees of privacy as you move through the site, linking the community path on one side, with the more private garden on the other. 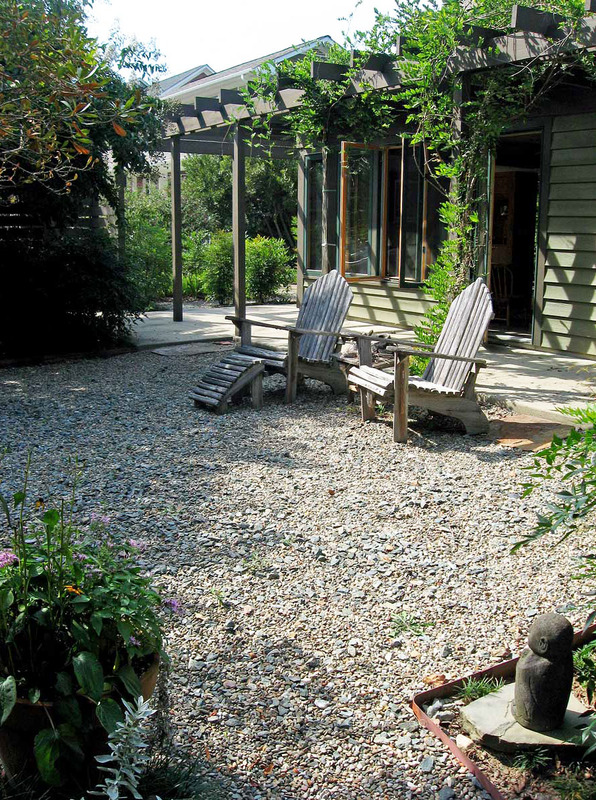 We designed access to the outside, house and car to be free of level change. On such a tight lot, screening is important. A vine-covered fence allows cars to park close to the entry but keep them hidden from view. An open plan with long diagonal views, plenty of windows, and hallways that end in views out, all help make the house feel bigger than it is ( 1st floor: 1380 s.f., 2nd floor: 365 s.f.). Depending on the season, exterior doors can be thrown open and outdoor spaces become continuous with indoor ones. Even the shower gets its own outdoor space with a private garden view and a protected space for outdoor bathing. Shortened walls, storage cabinets, and sliding panels softly define boundaries between rooms, creating flexible degrees of privacy and openness. Such permeable boundaries allow for the sharing of space and views, making public spaces feel bigger and more private ones feel less confined. A bookcase, for example, which screens Nancy’s office from the living room, houses a shoji screen that pulls out for privacy and then disappears to reveal a garden view beyond. 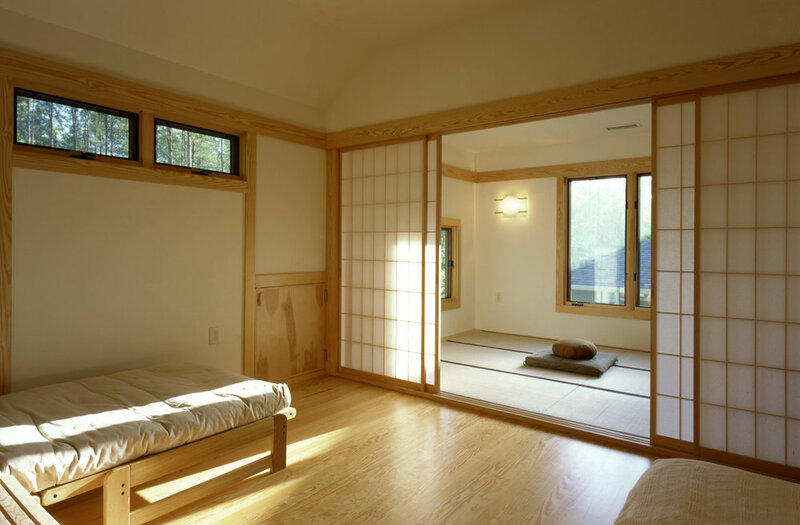 We strove also to design spaces that could be used in multiple ways, such as a hallway which doubles as a laundry area, or the upstairs tatami room, which doubles as a yoga and meditation space, as well as a guest room for grandchildren. 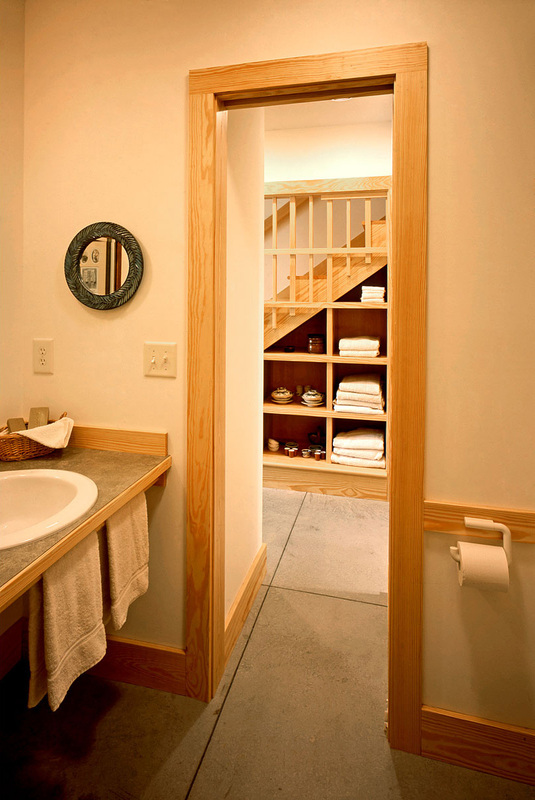 Working hand in hand with the Leinbachs, we developed space-saving ideas and details: thickening walls to provide storage, using pocket doors and open shelving to eliminate swinging doors, and exploiting all hidden voids where accessible.